Threshold Housing Advice closed its doors for the final time last week. This homeless service's crucial work has been carried out in our Borough since the 1970s but it was forced to shut down after the Conservative Administration removed 100% of its funding. This vindictive act was finally debated at this packed Full Council Meeting. It is to the credit of the Hammersmith and Kensington Times that they have chosen to feature this issue on their front page. You can buy the paper from all good local news agents. 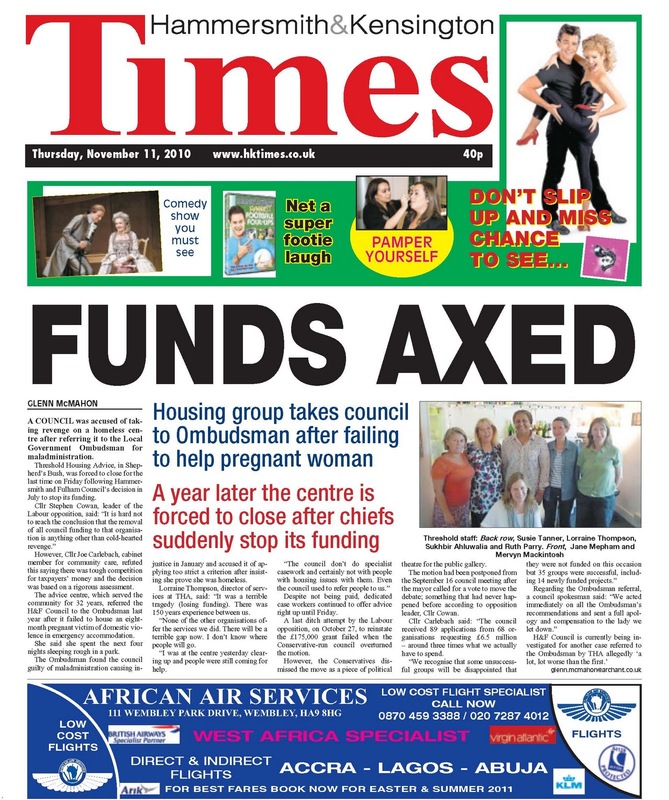 Regular readers will recall that Threshold took H&F Council to the Local Government Ombudsman after the Conservative run authority refused to aid a pregnant homeless woman who had been badly beaten up by her so-called partner. The Ombudsman found the Council to have be guilty of "maladministration". The Administration's response to this was to seek to put the charity out of business - which it has now successfully done. Threshold actually has another case against H&F Council which it has now also taken to the Ombudsman and this appears to even worse. In fact, Conservative councillors were so incensed by the negative national media coverage following the first Ombudsman case that they even tried to stop all debate on the charity's future. You can read the Hammersmith and Kensington Times article here.